SUBHEAD: Will magic, solar-powered autonomous cars allow us to continue plundering the Earth? 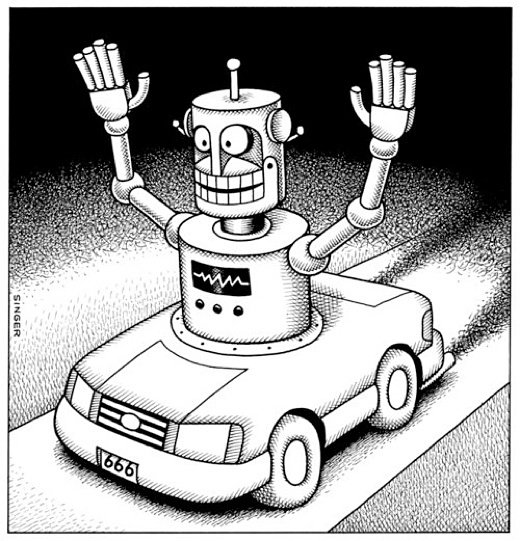 Image above: Andy Singer cartoon of a driverless car. From original article. We constantly hear that driverless cars are just around the corner. We’re told they will revolutionize transportation and enable us to continue using our car-based transport and land-use system. If they’re made by Tesla, they’ll be powered by magic, solar-powered, super efficient batteries and we’ll all be able to keep living our hyper-mobile, hyper-consumptive lifestyles without any damage to the environment. The only problem is we’ve been hearing about all this for the last five to ten years and there’s no evidence that it’s anything but the same old technological, capitalist utopian dreck that we’ve been hearing since General Motors debuted “Futurama” at the 1939 World’s Fair. Technological utopianism fueled by science fiction is nothing new. If you’ve never seen it, watch Disney’s short animated film “Magic Highway” from 1958. It’s remarkably similar to this recent promotional film for an Elon Musk tubular underground transportation system in Los Angeles. 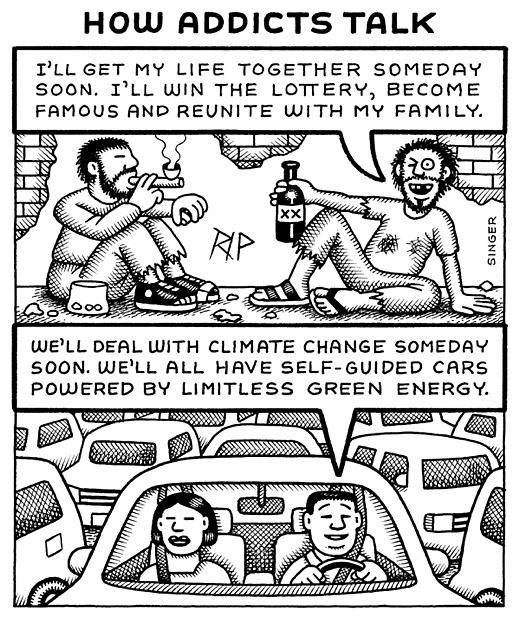 They’re both fantasies that maintain our inefficient, car-oriented transportation and land-use systems and help the Automobile Industrial Complex retain its stranglehold on our imaginations. They’re also fantasies that dovetail with corporate capitalism’s fantasy of automating the entire workforce and using technology to eliminate jobs and reduce costs. In many ways, driverless cars have all the makings of a massive cult–the Cult of Technology. This is the idea that technology will somehow solve the problems of human greed, over-population and over-consumption of planetary resources, and therefore will also solve the related problems of climate change, waste, pollution, and species extinction. It’s an old fantasy but one we still buy into. It preys on our laziness and gullibility and it distracts and deludes us so much that we can’t see basic realities staring us in the face. Non-profit “transit” advocacy groups like MoveMN have held seminars on it as if it’s an impending reality. Cheerleaders for driverless cars claim they will reduce traffic deaths, increase the efficiency and carrying capacity of roadways, reduce costs and revolutionize transportation. Even companies like Intel are making bets on chip technology for driverless cars. With all this money and hype, you’d think that driverless vehicles will be taking over our roads in the next ten or twenty years. “Google often leaves the impression that, as a Google executive once wrote, the cars can ‘drive anywhere a car can legally drive.’ However, that’s true only if intricate preparations have been made beforehand, with the car’s exact route, including driveways, extensively mapped. Data from multiple passes by a special sensor vehicle must later be pored over, meter by meter, by both computers and humans. It’s vastly more effort than what’s needed for Google Maps. …Pedestrians are detected simply as moving, column-shaped blurs of pixels—meaning …that the car wouldn’t be able to spot a police officer at the side of the road frantically waving for traffic to stop. …The car’s sensors can’t tell if a road obstacle is a rock or a crumpled piece of paper, so the car will try to drive around either. (Chris) Urmson (former director of the Google Car team) also says the car can’t detect potholes or spot an uncovered manhole if it isn’t coned off. But part of the technological challenge of driverless cars is that they have to share the road with humans. We debate the ethics of driverless cars taking away our jobs, or debate whether people will accept them, as if they are an inevitable reality. But this debate obscures the fact that the technology itself is insanely complicated and expensive and many decades if not a lifetime away from widespread usage. It’s one thing to make some test cars work consistently in ideal situations and another to get tens of thousands of them operating in concert with non-driverless cars, pedestrians, weather and all sorts of other variables. A simple, fixed-guideway computerized transit system like Bay Area Rapid Transit (BART), with just five lines and a maximum of 54 trains, on set schedules to set destinations, hasn’t been able to go fully driverless and, at its best, experiences failures of on-time performance of around 10%. Magnify this error rate by thousands for tens of thousands of autonomous cars driving in a metro area with pedestrians, cyclists, animals, potholes, unexpected road work and all sorts of other variables, and you start to get a sense of how complex the engineering problem becomes when you scale it up from just a few test vehicles. I can’t always get decent cell phone reception or a transit ticket vending machine that works correctly. Yet I’m supposed to believe techno-utopian cultists who tell me that, in twenty years, we’ll all be getting around in driverless cars? They sound like Disney’s “Magic Highway” or like they’ve been watching too many Star Wars movies. Image above: Andy Singer cartoon of a addicts of drugs and addicts of technology. From original article. Let’s look at some of the folks hyping this technology. No one is more prominent than Elon Musk–a guy whose companies, Tesla and SpaceX, have never been profitable. Yet at one point, Tesla was valued at more than major motor vehicle companies like Nissan or Ford, based entirely on hype and stock speculation. His Hyperloop company hasn’t built an actual system anywhere in the world and is more of a concept and test track than an actually viable transportation system. His battery and solar companies are also more hype than actual profitable product. His solar business amounts to his acquisition of the company “SolarCity” from which he laid off 20% of the workforce. This is a guy who wants to save humanity by colonizing Mars and who sent one of his cars to orbit Mars as a publicity stunt (but missed it). His net worth is the product of pure stock market speculation, largely based on his cult of personality. To this point, Tesla has mostly made luxury electric automobiles that resemble fancy wrist watches or smartphones–status objects for the wealthy. If his Model 3 isn’t successful, speculators could lose a lot of money, and Tesla recently had to lay off over 500 people and plans to lay off 2,500 more or about 9% of its workforce. Indeed some financial analysts have finally started questioning his claims and the value of his companies. While some of his companies could be successful, they also have all the makings of a classic Ponzi scheme or failed start-ups on a massive scale. Musk companies like Hyperloop remind me of the Personal Rapid Transit (PRT) scheme–a concept that hung around for almost 40 years before being abandoned or relegated to airport people-movers. This included Taxi 2000, a failed Minnesota company whose investors sued each other to try to recoup some of millions of dollars they foolishly invested. Indeed many PRT simulation videos resemble the ones linked to at the beginning of this post. Ironically, the PRT concept has died out in part because it has been eclipsed by the driverless car concept. So when someone like Elon Musk makes wild claims about driverless cars, I’m skeptical. Google spun off its driverless car project (within Alphabet) to Waymo and is just focusing on development not manufacture. Uber has gotten out of the driverless truck business, perhaps because the backup driver intervention rate was as bad as for its cars (almost once per mile). A driverless car is still a car. It still needs energy, at least some of it from petroleum, to be manufactured, moved and disposed of. Anywhere from 23-46% of the energy a car consumes in its lifetime is an inherent part of its manufacture and disposal. The steel, aluminum and plastics in its body and tires, the lithium (or lead/acid) in its batteries, and the asphalt and concrete for its roadways all require fossil fuels, mining, rare-earth metals, and/or huge amounts of energy to manufacture. Driverless cars fail to address any of this and they fail to fully address another core problem of automobiles–inefficient land use. Proponents claim that cities of driverless cars will reduce the need for parking and more efficiently use existing roadways but this is assuming the technology is able to decrease vehicle following distances, an even tougher engineering problem. It’s futile to argue with a fantasy but, even if driverless cars could become widespread, why would I want more technology when all I need is denser, car-free, walkable cities where jobs, goods and services are closer together? It’s a much surer, cheaper, less resource-intensive path to environmental sustainability.